Four colourful, friendly aliens play, dance, sing and watch the everyday activities of young children via TV screens embedded in their tummies. First broadcast on Easter Monday 1997, this replacement for Playdays became headline news - parents were outraged by these freakish dancing aliens teaching their toddlers babytalk. Amusingly, these complaints were from parents doubtless reared on the gibberish language of The Flower Pot Men (BBC, 1952-54). Makers Ragdoll based the series on sound educationalist principles and test-screened episodes in nursery schools, adjusting aspects of the programme accordingly. " Teletubbies tries to reflect the perceptions of very small children," said Ragdoll , "The deceptive simplicity of Teletubbies has been designed to give your children a sense of achievement and success, to make them feel more confident and assured". Producer Anne Wood insisted the programme wasn't 'instructional' but reaffirmed the sentiments which informed Play School - that children learn to think through play. 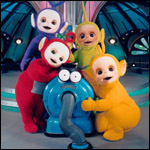 Teletubbies was aimed at the children of the technological age and Ragdoll expected viewers to interact and imitate what they saw on screen. Episodes followed a reassuring pattern of events which could be predicted by young children. A baby-face sun appeared over Teletubbyland and voice trumpets popped out of the ground - "Time for Teletubbies !" - heralding the arrival of Tinky Winky (big and purple), Dipsy (funky and green), Laa-Laa (yellow, shy and giggly) and Po (the littlest Teletubby). They would sing songs, dance, eat tubby custard and tubby toast and play with vacuum cleaner Noo-Noo with great regularity (a nominal 260 episodes were in fact assemblies of a finite stock of sequences). A spinning windmill signalled an incoming transmission to the TV sets in the Teletubbies' tummies - these films had children engaged in a variety of activities or the occasional story. This directly echoed the famous Windows of Play School - viewers could guess which Teletubby would show today's film. Teletubbies quickly became a global phenomenon, selling to 113 countries in 44 languages by the end of 2002. Merchandise sales, of everything from soft toys to Tubby Toast, totalled more than £1.2 billion. This success has focused intense activity in the area of pre-school programming, directly influencing the likes of Tweenies (BBC, 2000-) and Fimbles (BBC, 2002-).